When it comes to depression many people deal with the difficulties that occur during the illness, like the struggle it is to get out of bed, to eat healthily and to exercise. Not many people touch on the subject of debt; debt and depression can go hand-in-hand. It doesn’t matter if you are normally good with money, being depressed can have a negative impact on your ability to make the right choices financially and you might find that you struggle with debt. Having depression is an illness, it will affect your ability to do any number of things that others take for granted. It is surprising just how much it can affect your body as well as your mind! Dealing with your depression is a long and often slow process, it is about coping with your every day in a manner that allows you to move forward and to make progress towards living a healthy lifestyle. What I am not saying is that you will ever completely kick the depression away, you might, but for some people, they will live with the depression for the rest of their lives. The trouble with depression is that you don’t feel good, and this can have a negative impact on how you spend money. Often people hope that by spending money it will help the depression go away. Or they don’t realize how much money they are spending. If you don’t feel able to manage your life, managing your monthly budget is often beyond you mentally; it is not something you are able to deal with and that is not something to feel shame about, it is all part of the illness that you are suffering from. If you are working, when you’re depressed it is difficult to find motivation to get up and to continue as normal and that can include going to work. In this case going sick is an option that you will need to consider, however, this will have an impact on the money that you earn and this could stretch your budget to a point where you turn to some form of credit to help you get through the difficult periods. However, at some point, you have to face the debt which you have incurred. That in itself can lead to problems addressing the situation and can make you feel unwell. Coping with depression and working full-time is not easy, I left my job outside of the home when I became depressed when I felt better enough to consider working I opted for a work at home based business because I just didn’t feel emotionally strong enough to contemplate going out to work. Working from home does give me flexibility; when I am not feeling well enough to work I am not phoning in sick, but the other side of this means I do work long hours to make up my time. You might be surprised by this statement, but if you are struggling to get out of bed and do some of the normal day-to-day living, you might have the attitude that goes with it too! If you have no interest in yourself how can you take care of your finances as well? It might seem that you aren’t taking responsibility for your finances and don’t care how you will pay back a debt or two. However, the truth is that you aren’t able to deal with the difficulty of looking after your money. Sometimes, this can come across as having a bad attitude or just not caring, but that is just part of the illness, you haven’t necessarily given up on creating a budget or living within your means, it just becomes too difficult to manage your money in a manner that you would previously have done. If you have suffered from depression you will know that it is not something that you can change, people will notice the change in you before you notice the symptoms of depression. How you feel and act might change, but it is easier for a person who feels depression to hide their true feelings until it is too late. This sounds drastic and in some ways it is, the earlier you can understand the way you are feeling is not normal, that you might be suffering from depression and you seek help, the easier it is to start feeling better. If you let depression simmer under the surface, when it does finally crack out of the shell that you try to hide it in, the more difficult it is to cope with. 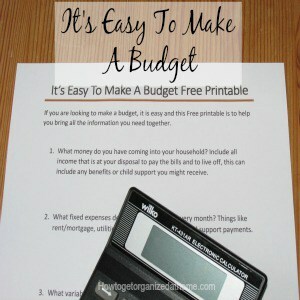 I love the author of this book, he deals with writing a budget, it is something that can help with the debt side. It isn’t unusual for a depressed person to go shopping, it is the buzz they feel when finding something and buying it that makes them feel good. However, this feeling doesn’t last and the need to get that feeling again only comes with the purchase of more items and spending more money. You then end up with lots of items you don’t really need or want and more debt than you planned, all to help you feel better. Therefore, if you are feeling depressed it is important to seek help as soon as possible, it is not something that you should try to go through alone, getting help sooner can help to reduce the debt associated with your depression before it gets out of control. What advice would you give to someone who is struggling with debt and depression? If you are looking for other articles on this topic head over to the landing page where you will find links to other articles on depression and stress.